This chapter examines the preconditions, content, and consequences of the school act of 1842, which was the main primary school legislation in nineteenth-century Sweden. This chapter shows that the school act defined a school system that placed the main responsibility for funding and organizing schools in the hands of Sweden’s parishes. Although the school act did not make schooling mandatory for all children, it required all parishes to establish at least one school. As a result, schools were soon distributed throughout Sweden, although the teaching that children received remained limited in terms of attendance, content, and the length of the school year. This work was supported by the Swedish Research Council under Grant 2016-05230. Resulting from a complicated political process initiated by a royal proposition on February 1, 1840, the Swedish school act of 1842 was issued on June 18, 1842, and signed by King Karl XIV Johan. 1 This school act was subject to recurrent criticism, continuously revised by circulars and regulations, and was modified by two additional school acts in 1882 and 1897. Nevertheless, the school act of 1842 created the main structure for Sweden’s primary school system (folkskoleväsende) that lasted through the nineteenth century and achieved high enrollment levels at the end of the century. Since the school act of 1842 was the main piece of primary school legislation of nineteenth-century Sweden, this chapter will focus on this act and its preconditions, content, and consequences. It will show that the school act was the result of a lengthy political debate on popular education, describe the school system that the school act designed, and discuss the effects of the act using both existing research on the topic and primary sources. Over time, the central government’s grip on the Swedish school tightened in some respects. In 1861, the first state school inspectors were installed, and school standards (normalplaner) were issued in 1878, 1889, 1897, and 1900. Those standards were a set of recommendations for a number of school types and curricula. To increase the quality of school buildings, Royal Building Plans (normalritningar) were issued in 1865 and 1878. 39 Nevertheless, the power of the Swedish school system primarily remained in the hands of the school districts, in line with the formulations of the school act. The Swedish historiography of schooling has debated on how these two curricula should be understood. In addition to being interpreted as an outcome of the tension between conservative and liberal views of popular education, the school act has also been interpreted in terms of social control: The school act allowed for a basic education deemed appropriate for the knowledge that the people of the lower classes required. 50 On the other hand, the possibility of teaching a more comprehensive curriculum has been interpreted as an attempt to foster competent modern citizens. 51 A third line of interpretation has acknowledged that the school act was promoted by landowning farmers, who favored a broader curriculum. 52 These perceptions of the school act will be discussed below when the consequences of the school act are examined. As a consequence of the uneven distribution of schools prior to 1842, the impact of the school act varied. For regions that already had plenty of schools, their development following the school act of 1842 was less conspicuous. However, the impact of the school act was more obvious in the regions that lacked schools, which is also indicated by available statistical compilations from 1839 to 1862. 62 Despite the shortcomings of such a periodization, a comparison shows striking regional variations in the number of permanent and ambulatory schools. As Fig. 9.2 shows, both the diocese of Lund and the city of Stockholm were characterized by striking continuity. In 1839–1862, the number of schools increased from 40 to 44 in Stockholm and from 647 to 721 in Lund diocese. In other areas, the growth was much more rapid. In the 161 parishes of the diocese of Härnösand, the number of permanent and ambulatory schools increased more than sevenfold from 28 to 201. 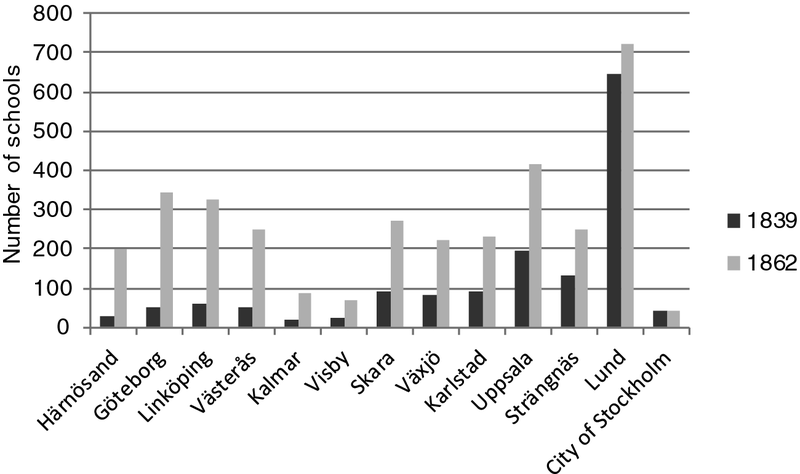 Growth was also remarkable in Göteborg, Linköping, Västerås, and Kalmar, which had between four and six times as many schools in 1862, as in 1839. To remedy this focus on reading and catechesis, the Ministry of Education and Ecclesiastical Affairs issued an ordinance in 1864 urging schools to teach biblical history prior to catechism, to introduce writing and arithmetic early on, and not postpone the other subjects. 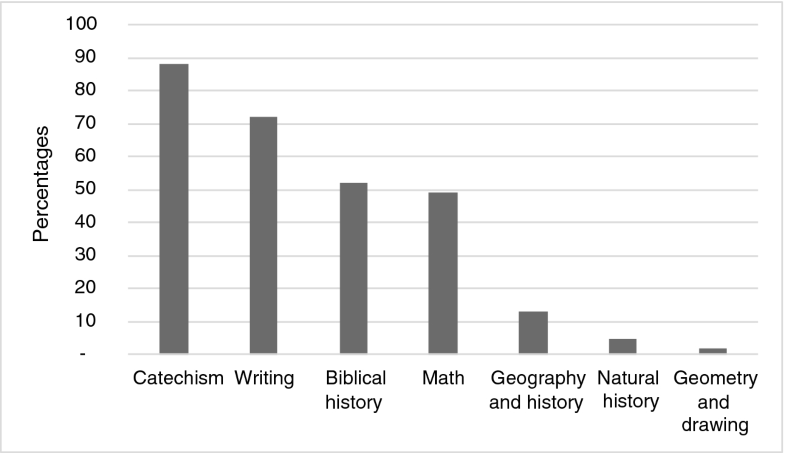 73 As Figure 9.4 shows, unpublished statistics from 1865 nevertheless indicate that the curriculum remained rather narrow. 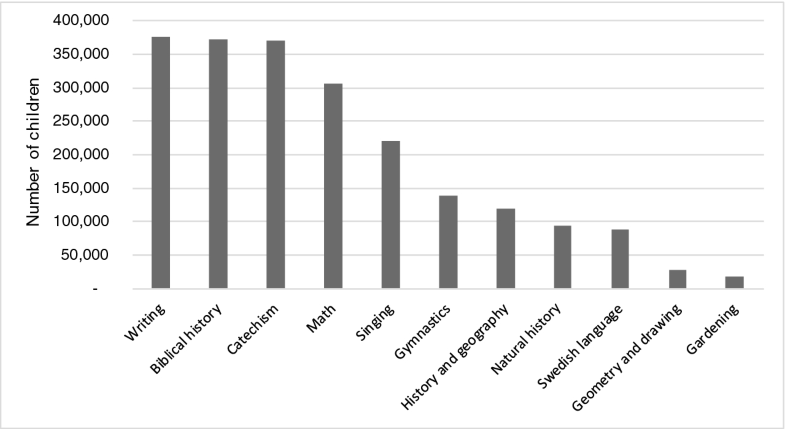 Apart from reading, the main subjects taught in Swedish primary school were writing, biblical history, and catechism. 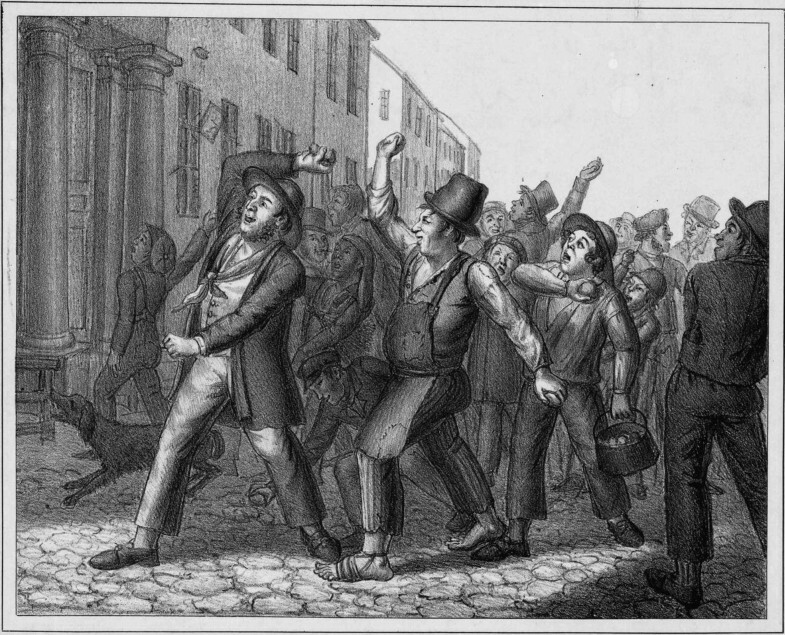 Although this limited education may be interpreted as a result of a conservative vision of schooling, or the ruling classes’ interest in upholding the social order in a protestant nation state, it was also a result of local communities’ interest in a basic schooling that neither demanded too much resources from the parish, nor was too time-consuming for their children. State school inspectors frequently reported that parents preferred that their children not learn anything other than reading and the catechism; lamented that parents placed particular emphasis on memorizing the catechesis; complained that parents took children away from school once they had learned the catechesis; and expressed indifference to, or even dislike of, any teaching beyond reading and the catechesis. Parents also considered writing and math to be not particularly important, and banned girls from attending physical education classes because they considered such classes to be indecent. 79 In this respect, the narrow curricula in the primary schools, following the school act of 1842, were also the result of parental demand. While created to promote the interests of a protestant nation state, the school act was made possible by the organizational and fiscal strength of the local school districts and implemented in a fashion that promoted the interests of parents and the local community. Warne, Om tillkomsten av vår första folkskolestadga, 165. Johansson, “History of Literacy in Sweden,” 29–43; Lindmark, “Swedish History of Literacy,” 100–4. Lindmark, “Swedish History of Literacy,” 102; Lindmark, “Hemundervisning och läskunnighet,” 68–70. Rodhe and Warne, Svenska folkskolans historia I, 361, 389; Lindmark, “Hemundervisning och läskunnighet,” 72. Rodhe and Warne, Svenska folkskolans historia I, 307, 319, 494–96. Nilsson, Pettersson, and Svensson, “Agrarian Transition and Literacy: The Case of Nineteenth Century Sweden,” 76–96. Boli, New Citizens for a New Society, 222; Klose, Folkundervisningens finansiering, 96. See also Larsen’s chapter on the Danish school laws of 1814. Larsson, En lycklig mechanism, 33, 36. Westberg, Funding the Rise of Mass Schooling , 139. Lindmark, ed., 1812 års uppfostringskommittés enkät, iii. Rönström, “Forskardebatten kring 1809 års regeringsform,” 450–51. Tröhler, “Curriculum History or the Educational Construction of Europe in the Long Nineteenth Century,” 285–87. Thunander, Fattigskola - medborgarskola, 92–110. Wennås, “Ideér och intressen,” 47. Westberg, “‘Freedom for All! Injustice for None!” 223–27. See also Linge, Hur den svenska folkskolan kom till, 14. See, e.g., Boli, New Citizens for a New Society, 215; Linge, Hur den svenska folkskolan kom till, 12–13. See also Edgren, “Nationen mot korporationen,” 69–88. Magnusson, Sveriges ekonomiska historia, 211. Boli, New Citizens for a New Society, 217; Schön, En modern svensk ekonomisk historia, 69–73. Olofsson, “Upploppskulturer,” tab. 2; Berglund, “Soldater och stadsbor i förindustriellt gatuvåld,” 25. Petersson, “Den farliga underklassen,” 26–27. Boli, New Citizens for a New Society, 216–18; Lundgren, Den isolerade medborgaren: Liberalt styre och uppkomsten av det sociala vid 1800-talets mitt, 9–12, 31–33; Petterson, Frihet, jämlikhet, egendom och Bentham, 313; Rappe, “Från katekes till social fostran,” 12. Petterson, Frihet, jämlikhet, egendom och Bentham, 187. Lagerroth, “Lagstiftningsmakten i 1809 års Rf,” 234–36; Rönström, “Forskardebatten kring 1809 års regeringsform,” 450. Sjöstrand, Pedagogikens historia III:2, 127; Aquilonius, Folkskolans historia II, 319; Warne, Om tillkomsten av vår första folkskolestadga, 132; Wallner, Folkskolans organisation och förvaltning, 2. SFS 1842:19 §1; BiSOS P (1900), tab. 2. Aquilonius, Folkskolans historia II, 44–54; Wallner, Folkskolans organisation och förvaltning, 30–42; SFS 1858:31. SFS 1842:19 § 2; SFS 1862:15 § 23; SFS 1897:108 § 8; Sörensen, Svenska folkskolans historia III, 42–43. SFS 1843:27. See also Nydahl, I fyrkens tid, 16–17. Westberg, Att bygga ett skolväsende, 135–43. The political and economic culture of this school organization is investigated in Westberg, “A Conflicted Political Will to Levy Local Taxes,” and Westberg, Funding the Rise of Mass Schooling , chs. 2–3. Westberg, Funding the Rise of Mass Schooling , 116. Westberg, Funding the Rise of Mass Schooling , 147–48. SFS 1842:19 § 6; Aquilonius, Svenska folkskolans historia II, 419; Westberg, “How Did Teachers Make a Living?,” 36. Byggningabalken, 26 kapitlet 1§, in Backman, Ny lag-samling. H. 1; SFS 1842:19 § 3; Wallner, Folkskolans organisation och förvaltning, 131. Tegborg, Folkskolans sekularisering 1895–1909, 18–19; Wallner, Folkskolans organisation och förvaltning, 28–29; Westberg, Att bygga ett skolväsende, 138. Westberg, Funding the Rise of Mass Schooling , 14–15. SFS 1842:19 § 8; SFS 1882:8 § 35. Johansson, En studie med kvantitativa metoder av folkundervisningen i Bygdeå, 145. Wallner, Folkskolans organisation och förvaltning, 65. Regarding feminization of the teaching profession, see Florin, “Social Closure as a Professional Strategy,” 17–26. Sörensen, Växelundervisningssällskapets normalskola och folkskoleseminariet i Stockholm, 49. SFS 1842:19 § 5, 7. See, e.g., Isling, Det pedagogiska arvet, 584. Boli, New Citizens for a New Society, 236. Lindmark, “Kunskapskraven i den framväxande folkskolan,” 108; Thunander, Fattigskola - medborgarskola, 237. Klose, Folkundervisningens finansiering, 223; Wallin, “Att forma en skolform,” 375; Richardson, Ett folk börjar skolan, 7. Johansson, En studie med kvantitativa metoder av folkundervisningen i Bygdeå, 242–44; Petterson, “1842, 1822 eller 1882?” 22. Petterson, “1842, 1822 eller 1882?” 27. Aquilonius, Svenska folkskolans historia II, 332; Christensen, “Radikalism som strategi,” 737. Wallner, Folkskolans organisation och förvaltning, 7. Parish minutes, December 7, 1851, K1:3, Timrå ka, HLA; Parish minutes, August 8, 1853, K1:6, Tuna ka, HLA. Berättelse om hwad i Riket och dess Styrelse sig tilldragit sedan sista Riksdag 1856–1858, 85. See also Paulsson, Historik öfver folkunderwisningen, 432. Wallner, Folkskolans organisation och förvaltning, 7–13. Kungl. Maj:ts Nådiga Proposition, no. 7 (1840–1841), Appendix. Although data were continuously collected by the Ministry of Education and Ecclesiastical Affairs, the ministry could not afford to make statistical compilations from 1840 to 1861. BiSOS P (1868), 22–23; En studie med kvantitativa metoder av folkundervisningen i Bygdeå, app. 11:2. Johansson, The History of Literacy in Sweden, app. 1. See, e.g., Berättelse om Folkskolorna inom Upsala Erkestift åren 1861–1863: Gestrikland och Helsingland, 18. Boli, New Citizens for a New Society, 233–34; Uppgifter angående folkundervisningen i Medelpad 1865, H3abd:1, ED, RA. Westberg, Att bygga ett skolväsende, ch. 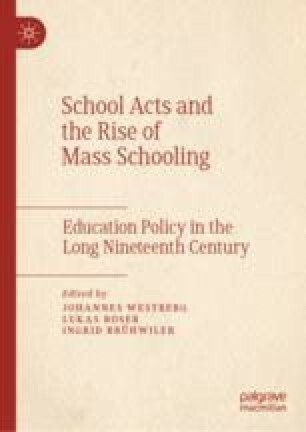 5, 9; Westberg, Funding the Rise of Mass Schooling , ch. 4–7. Ljungberg and Nilsson, “Human Capital and Economic Growth,” 80; Uppgifter ang. Folkundervisningen inom […] Medelpads kontrakt för år 1865, Stat. avd., H3abd:1, ED, RA; BiSOS P (1868), 22–23. Aquilonius, Svenska folkskolans historia II, 419. Johansson, “Kunskapskraven i den framväxande folkskolan,” 153–55. ”Royal Circular of April 22, 1864,” in Folkskolestadgan med flera författningar rörande folkundervisningen, 26; BiSOS P (1868), xiv. Berättelse om Folkskolorna inom Upsala Erkestift åren 1861–1863: Upland, 5. Statistiskt sammandrag 1865, H3bb:1, ED, RA. Johansson, En studie med kvantitativa metoder av folkundervisningen i Bygdeå, 243–44. Johansson, En studie med kvantitativa metoder av folkundervisningen i Bygdeå, 207. Johansson, The History of Literacy in Sweden, 60, 89, 91. Berättelse om Folkskolorna inom Upsala Erkestift åren 1861–1863: Upland, 4, 6; Berättelse om folkskolorna inom Linköpings stift åren 1861–1863, 22, 27; Berättelse om Folkskolorna inom Skara Stift åren 1861–1863, 47; Berättelse om Folkskolorna inom Strengnäs stift åren 1861–1863, 88; Berättelse om Folkskolorna inom Westerås stift åren 1861–1863, 23; Berättelse om Folkskolorna inom Skara stift åren 1869–1871, 35. Andersson, Jens, and Thor Berger. 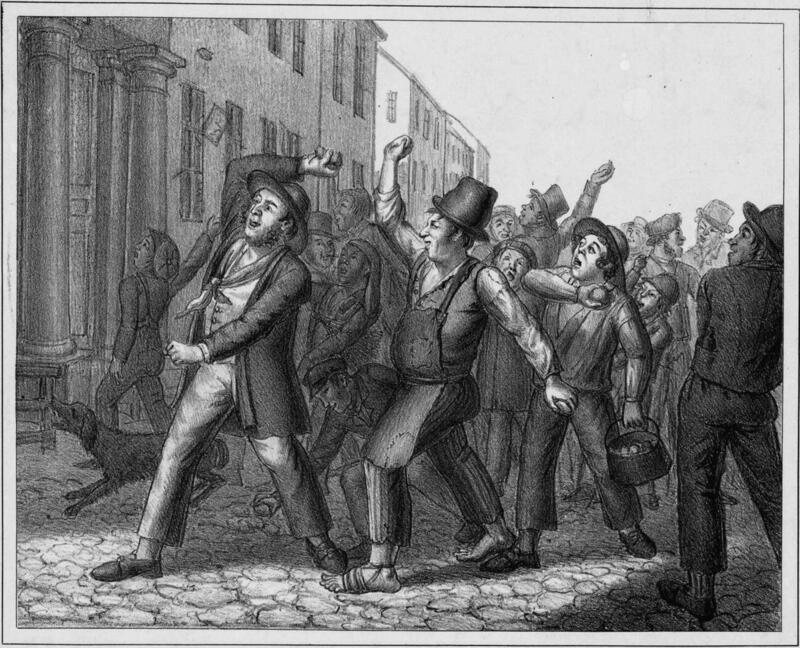 “Elites and the Expansion of Education in Nineteenth-Century Sweden.” The Economic History Review (Published Online). https://doi.org/10.1111/ehr.12738.